Thank you for the get well soon wishes!! All of us have recovered and are back to the daily routine. From today the school is off for two weeks for spring + Easter. Hopefully at least when the holidays begin we'll have some pleasant days. This week I tried a new stitch and it came out quite well. And there's something else that I tried too..
Look what I have got!! Some weeks back there was an incident in one of the FB groups, were a crafter's photos were shared shamelessly by another lady as her own on her page. When this was discovered, it was suggested to use labels on the items rather than watermarks since watermarks also could be erased. I am not sure how it'll stop the thieves, but since then I had been considering some means to label my work especially the crocheted wearable. It was coincidentally at this point I got introduced to The Dutch Label Shop and was offered a discount to try out their product. I was hesitant initially - because it involved signing up . But in this case, I took the plunge. Do have a visit to their website and you'll see the various custom made labels ordered by their customers. Once I created a login at the website, the rest of the design part was super easy.It just takes a few minutes to decide the text and the color of a basic label and your job is done. 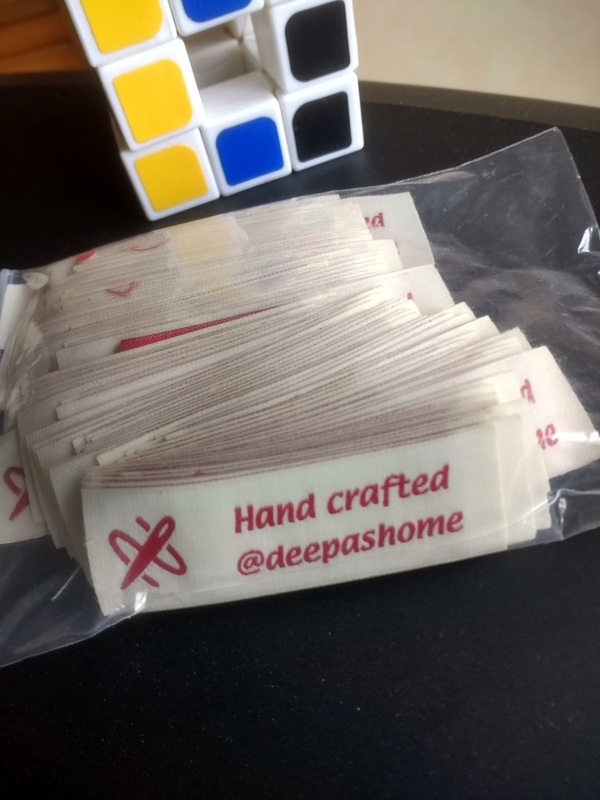 They are an online store and have a quick shipping policy - my labels came to me in a little more than a week. They have their presence in 14 countries, so shipping will not take so much of a time. Ok, now to the stitching part.. The pink one is the first one I tried by keeping the loop of the stitch loose. It gives a dimensional effect to the flowers. 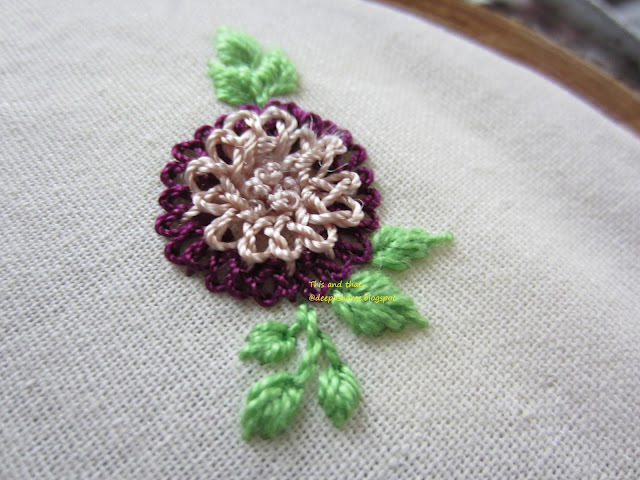 The purple flower loops are pulled a little more tighter - I like both of them. 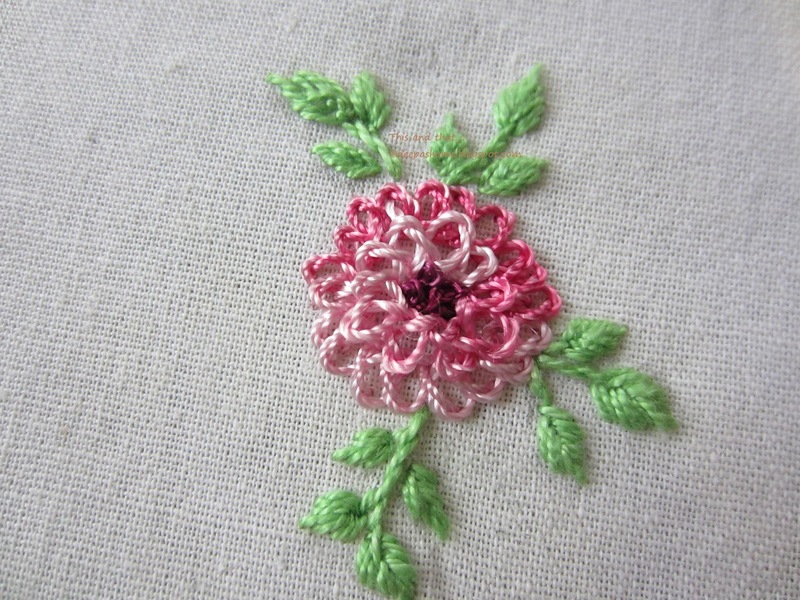 Mary Corbet has a very good tutorial on Braid stitch here. 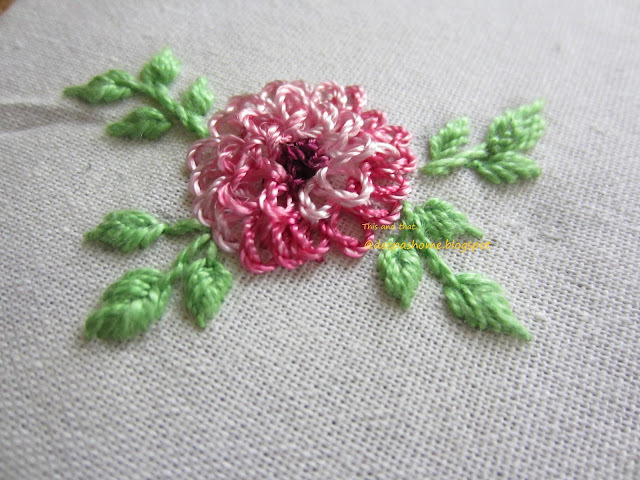 To make this flower, just don't pull the stitch loop too tight. The flower has turned out beautifully - well done indeed! Oh, how absolutely brilliant! The braided flowers are stunning. I know this stitch and will try it in a circle like this. Good idea to have a name/label inside the photo instead of a watermark. These flowers have a beautiful lacy look. I would think it would take practice to keep the correct loop size. Amazing transformation of the braid stitch ! I love those flowers - never would have thought of using the braid stitch to make them though. As for people passing work off as their own, I had an incident several years ago. I used to do folk art back in the day when it was popular and had created several wooden Raggedy Ann & Andy 'dolls' that I added yarn hair too. It was made in a very particular manner and hard to copy. When I got out of folk art I sold several of my pieces in a yard sale and was astounded to see my dolls being sold at a craft show. Knowing full well they were mine, I nonchalantly looked for my initials on the back - of course they weren't there (obviously painted over). I asked the lady who made them and she said she did. I didn't call her on it because I didn't want to make a scene but from the way I looked at her I'm pretty sure she got the message. Takes all kinds! Brilliant. 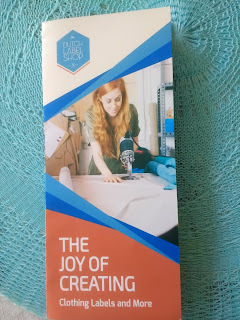 Thanks so much for that tip about labelling your work online and for the link to the Dutch Label Shop. I have signed up.